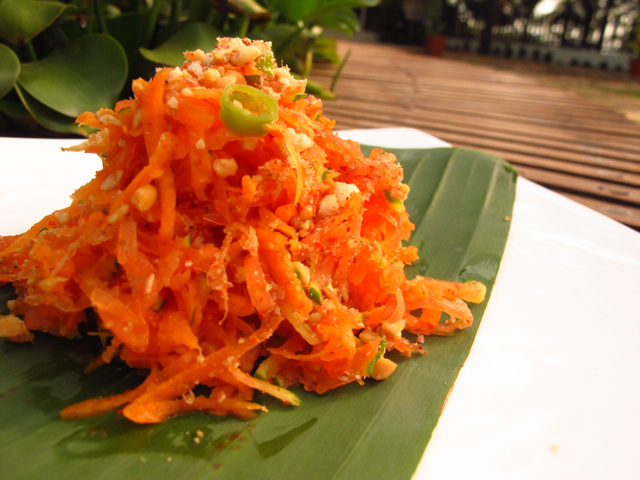 This appetizing Green Papaya Salad is the perfect starter before having a high protein meal. It contains high amounts of proteolytic enzymes like papain and chymopapain which will ensure that not only your meal is well digested but also it will scavenge and digest accumulated harmful proteins in your system. Papain enzyme is often used in scientific testing where efficient protein digestion is required because it’s one of the most effective and efficient enzymes that breaks down complex proteins into amino acids ready to be used for tissue regeneration, growth and development. Basically when you ingest this salad, some of the enzymes will be rendered inactive due to the stomach acids, but some will get through to the small intestine and boost your protein digestive abilities for the incoming protein rich meal. Aside from its protein digestion benefits, it will help reduce any flatulence, bloating, common Irritable Bowel Syndrome symptoms, as well as help prevent or clear any fungal overgrowth in your gastrointestinal tract. From an Ayurvedic perspective, this lively heating salad would ignite even the slowest gastric fire. Improving digestion of the coming meal, makes it perfect for people with too much Kapha, promoting weight loss and better health.